An installation view of Homecoming, Kiki Smith, cast aluminum with gold leaf, 2012“Kiki Smith/From the Creek” will be at the Thomas Cole House in Catskill through October 29. "She's very playful," says Kate Menconeri, curator of Thomas Cole House. Menconeri is speaking of Kiki Smith, whose exhibition "From the Creek" will remain at the National Historic Site in Catskill until October 29. This is the second installment of "Open House," a series in which contemporary artists react to the Cole homestead. Thomas Cole, the founder of the Hudson River School of art, lived in the home until his death in 1848. Smith's art is strategically installed. You don't see her work until you reach a small bedroom on the first floor—called "Uncle Sandy's Room"—in which an aluminum woman welcomes you with a bouquet of flowers and a penetrating gaze. This is a sculpture entitled Singer. Next to the ghostly female is a nine-foot-high tapestry, Guide, in which two smiling bald eagles drop mussels against rocks to crack them open. Looking at Guide, you realize that you've never seen an American Eagle smile. The third piece in the room, a woodblock print titled Remember, begins a theme that will be developed: leaves sprouting from apparently dead trees. Continuing through the house, I was impressed by small gestures. The stainless steel sculpture Glory is placed like a firescreen before the fireplace in the East Parlor—the only Kiki Smith piece in the room. Cole's Sitting Room, on the second floor, at first seems unchanged; then one notices two white porcelain figurines, Woman with Dog and Woman with Wolf, flanking a bust of poet John Milton on the mantelpiece. Simultaneously one hears a faint trickling sound: a recording of Catskill Creek (which is officially an artwork, titled The Creek). On a high dresser is an untitled glass sculpture of seven dandelion flowers, gone to seed—beneath a Victorian-style bell jar. And on the floor next to Cole's desk are two bronzes: Phantom and Tiller. Both depict dead trees sprouting leaves. (A tiller is new growth emerging from a tree stump.) Do the leaves represent ideas sprouting in Thomas Cole's mind? "Artists seem to be in conversation with each other over centuries," observes Menconeri. Smith is in a dialogue with Thomas Cole, but also with his house. She rearranged Cole's bedroom, then added The Falls I, a photograph of the artist upside down and shirtless, lying on a bed. Geometric hand drawing, in white and black, ornaments the photo. The piece's title suggests that a woman's hair on a bed cascades like a waterfall; in this context the image is reminiscent of nearby Kaaterskill Falls, cynosure of Hudson River School painters. Also, The Falls I gently sexualizes this austere chamber. Smith's hand is most visible in the Children's Room. Respite, a new bronze sculpture of a donkey climbing mountains, resembles an archaic children's toy. Sparkling intaglio prints in pastel colors decorate one wall, and the small bed contains two sets of flip-dolls designed by the artist. (A flip-doll has two identities, one at each end. When its "dress" is down, one face is visible; lift up the dress, and a second identity is revealed.) One doll is both Little Red Riding Hood and the Wolf; the other is alternately the Owl and the Pussycat. Kiki Smith is one of the most prominent living American artists. Her work has appeared in over 150 museum and gallery shows. Smith owns a home near the Thomas Cole House, on the same Catskill Creek that Cole loved to paint. In fact, her house is visible in several of Cole's paintings. Smith studies the wildlife of Catskill—including the bald eagles that inspired Guide. "It gives me something to ponder, when I see animals," attests Smith. "I just find it miraculous." A delectable show of Sanford Gifford paintings appears at the New Studio, on the same property. 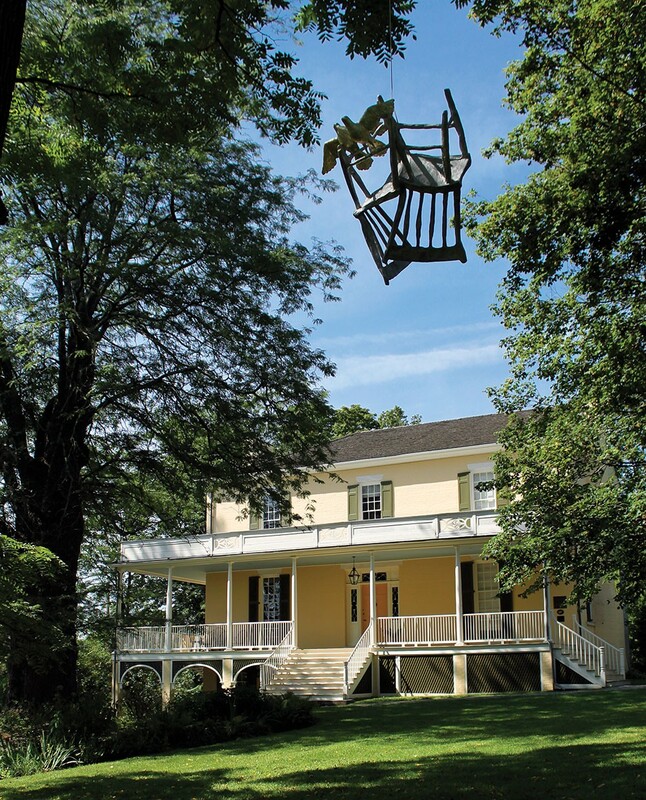 "Kiki Smith/From the Creek" will be at the Thomas Cole House in Catskill through October 29. (518) 943-7465; Thomascole.org.